8/1 and 8/2 ...So now that you know the history of this location, I'll continue. I trapped seven cats for the clinic on 8/2 and one more overnight for a total of eight cats. There is still one young male orange tabby out there but for now this job is finished. These older Phoenix neighborhoods, interspersed with lower-income apartments always have a LOT of free-roaming cats. Of course there was the usual aftercare on Sunday night and setting more traps for the second night trapping. When I arrived to trap, the caregiver's relative was there and explained that this would be difficult. Boy was she right! The elderly caregiver had cats in the house and several outside. It is always difficult when one does not know how many cats there are to trap. I set traps in the carport and a while later the caregiver's nephew comes over and a fight ensues between him and his aunt. So now I am caught in the middle of a family feud over the fate of these cats. So the nephew goes in the house and tries to put the cats in traps. Guess what? He gets bitten and has to go to the emergency room! With him gone I begin to gain the caregiver's trust. She now understands that the cats are coming back after being spayed and neutered. Problem was that the nephew wanted the cats gone. A lot of what we do as trappers is working with caregivers who love the cats often so much they do not trust our motives. I've actually had to have them talk to other caregivers I'd helped previously to assure them I was not there to take the cats away. I ended up with five cats, several from in the house and some outside. One was caught overnight. On the way home I picked up a kitten from a caregiver where I'd trapped a total of 42 cats over a several month period. This was, I hope, the last cat. I took six cats to the vet in the AM. On Tuesdays I always take cats to a clinic that helps those in need who cannot afford a donation. Unfortunately we have way too many caregivers in this situation and not enough vets who will donate their time. The result is a waiting list of caregivers needing financial assistance. Most often these are the same caregivers needing trapping and transport assistance due to large numbers of cats, no vehicle, elderly, disabled etc. This waiting list is growing especially due to hard economic times. Please consider making a contribution to help these folks. To donate visit ADLA's donation site. I picked up cats for aftercare in the afternoon before setting out for Tuesday night's trapping. Then I picked up cats at another vet to aftercare as the caregiver lived in an apartment with no place to keep them overnight (total 12 cats to aftercare). Tonight's trapping was for a caregiver in a wheelchair who clearly needed assistance. Caught two then two more overnight along with the straggler and the location from the previous night's trapping. Unfortunately I caught only the kittens - mom was still out there! Released the cats from previous night's trapping. Suzie took back the ones she'd trapped and picked up one more straggler trapped the second night. Our paths crossed at my house when she picked up the cats and then again at the vet. A word about our vets - we love them! Our vets are our most important resource. Without them this operation would come to a screeching halt. Fortunately we have wonderful, caring vets that always smile when they see LOTs of cats. Often we end up with more than we had planned and usually they will fix them. Sometimes we have to shuffle them around town but we always get them done. Once in a while they need to be held overnight and have to go to a vet the next day. ...picked up cats at the vet and more aftercare that night. 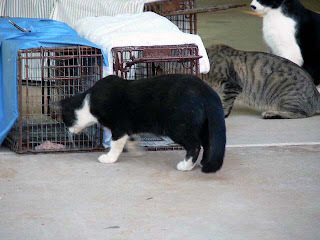 This night's trapping was for three cats at a trailer park in north Phoenix. I'd trapped in this park several times before and now the word is getting out and management is TNR friendly. After setting the traps at this location I took my drop-trap to get the mother cat left over from the previous night. I had her within 20 minutes! This was especially nice because the caregiver gave us a substantial donation in appreciation for the help. I went back to the park to discover all three cats had been trapped - a nice surprise. I had four more cats that would not be breeding any longer. Mind you there is a lot more going on than trapping in this business. There are calls to return, appointments to set, traps and covers to wash, transport of cats for caregivers, dealing with cats in traps without a plan, spay pack preparation, etc. It is often challenging but I like problem solving and I always say; "if anything can happen to foil best laid plans while trapping feral cats it will". At least once a week someone has a feral cat confined in a carrier and needs it transferred to a trap. Or, the vet calls and someone has not signed their paperwork for surgery. My favorite is when there are 50 cats scheduled for a high-volume clinic and the vet is ill and cannot make it. Or how about dealing with 45 too many cats showing up at a clinic and needing a place to hold them overnight and fix them the next day? 1 . Help getting the word out about TNR and our program. 2. Monetary donations to low-income caregivers with TNR. 3. 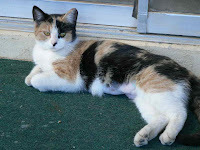 Help with trapping and transporting cats to clinics especially in Phoenix and the west Valley. We're looking for "a few good men (and women)" who like to lift heavy traps with cats, smell cat urine, spend evenings in alleys, and drive a lot...Oh, and do not mind a stinky, dirty car. You can see why there are plenty of job openings!